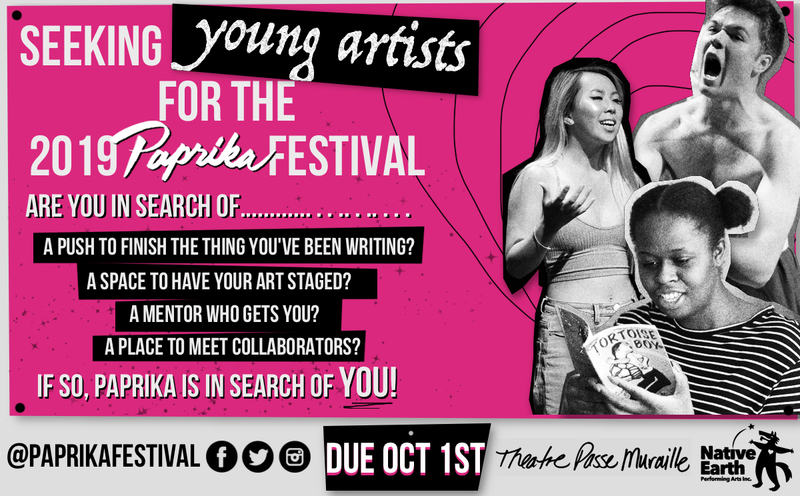 Call for Submissions for the 18/19 Paprika Festival!! Posted July 30, 2018 by John Wamsley & filed under Featured, News. We provide year-round theatre training and mentorship. At the end of the year, your original work is showcased in the week-long, fully-produced, uncensored Paprika Festival (May 20-26, 2019). Paprika Festival is free for all participants. We’re hugely dedicated to accessibility and diversity. We want to make this work for you (so that you can make your work!). Check out How to Apply below for alternative ways to apply to Paprika (and how we can support you). What can you do with Paprika? – Independently stage an original script or performance of your choice. – We provide the support and mentorship, you provide the team and the dream. – Turn your idea into a 30 minute script and receive a public reading by professional actors. – Write with the guidance of a professional mentor and peer support. – Create and perform an original piece of your choice through regular meetings with an Indigenous artist mentor and advisor. – The training and schedule are tailored to your interests, abilities, and goals. – Join a collective of artist for weekly training and rehearsals with a professional program facilitator. – Together, create and perform an original, devised piece for the Festival. – Develop your craft through mentorship from a professional theatre company and train in masterclasses with a professional director. – Join a team of aspiring leaders, administrators, and producers who work with Paprika’s staff to plan, promote, and present the 18th Annual Paprika Festival. – Provide administrative and hands-on support for workshops, fundraisers, and the Festival.